The Gold Key exhibition at the Met opens Friday, March 11th. Join us at the opening reception, 6:00-8:00 pm. 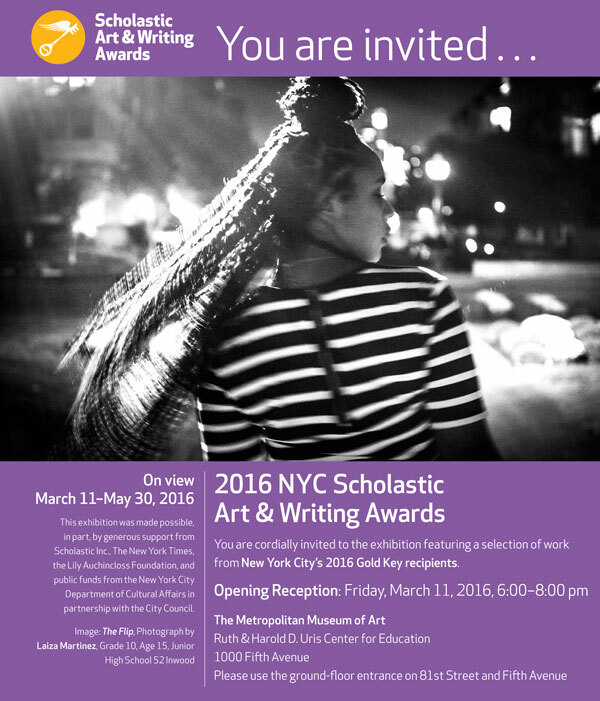 See the amazing Gold Key-awarded artwork created by NYC teens, mingle and meet other Gold Key recipients, participate in writing and art workshops, and watch the Gold Key writing students perform their work. Gold Key writing will be available to read electronically on iPads and in print. The event is free and open to the public. No RSVP is required. Share the invite with your friends, family, and educators. Don’t miss out on this awesome opportunity to hang out at the Met Friday night to celebrate the achievements of New York City’s 2016 Gold Key recipients. PHOTO RELEASE FORMS REQUIRED: Please note that students and guests 17 years and younger will need to complete and submit a photo release form to gain entry to the opening reception. Save yourself time by downloading and printing your photo release form now!